Connector Body: Nylon+GF UL94V-0 1/16"
Contact: Brass Gold Plated: 4u"--20u"
LED pool light, LED tunnel light, LED panel , LED liner. Games,shenzhen Universiade major projects etc. CHOGORI is located in the south of China Shenzhen,own more than 220 people`team,including research and development,sales and manufacture,4000 square meters factory,we have varies of test equipments of environment,electric and machinery 3 aspects. 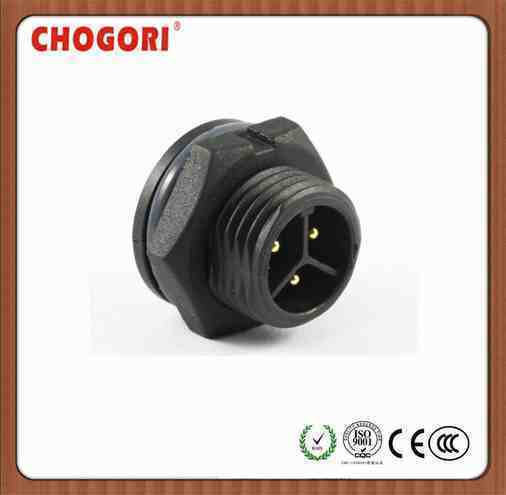 CHOGORI does not only provide waterproof and high current connectors,but also offer the service of customized connectors and cable assembly. CHOGORI forever memo is "Innovation is the permanent competitiveness",We constantly invest in new products and new technology research and development,CHOGORI has more than 20 items invention,utility model and design patents till 2011,international patent high current"NEWSOK" Jack has reached the world advanced level. CHOGORI has passed ISO9001 and strictly in accordance with the quality management system requirements to control the production and delivery,based on some of products and customer requirements,We already passed the CE,3C,UL,TUV and other units validation test.All CHOGORI products according to the requirements of RoHS,PFOS,REACH environmental protection to manufacture.